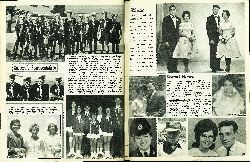 Members of the Takitimu Sea Scout Troop pictured at Darton Field before departing for the 9th Dominion Regatta at Motutapu Island, Auckland, at which they were successful in gaining the top trophies........the Jellicoe Trident for the best overall troop, the Cornwall Shield for aquatic events, and the Wellington Cup for junior rowing style. The leaders who accompanied the troop are at left. They are: Assistant Scout Masters Basil Johnstone, Gary Moles, Stuart Robertson, and Scout Master Keith Redstone. 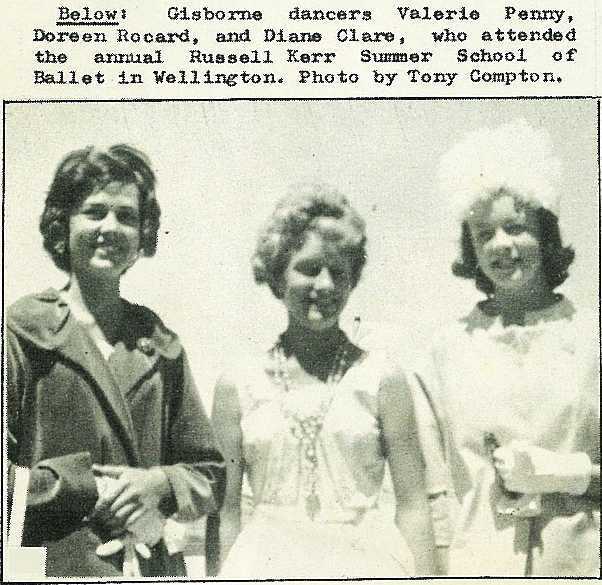 The team of Gisborne skaters which attended the National Freestyle skating championships in Palmerston North recently, returned with the most successful record ever for a local team. 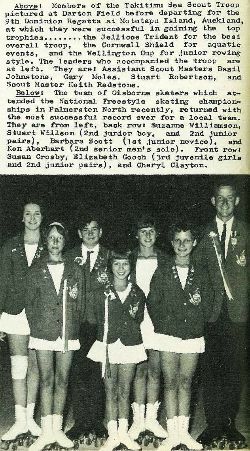 They are from left, back row: Suzanne Williamson, Stuart Willson (2nd junior boy, and 2nd junior pairs), Barbara Scott (1st junior novice), and Ken Aberhart (2nd senior men's solo). Front row: Susan Crosby, Elizabeth Gooch (3rd juvenile girls and 2nd junior pairs), and Cheryl Clayton. 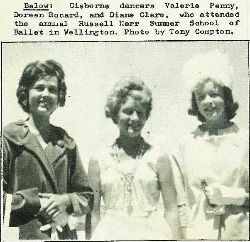 Gisborne dancers Valerie Penny, Doreen Rocard, and Diane Clare, who attended the annual Russell Kerr Summer School of Ballet in Wellington. Photo by Tony Compton.